7 Amazing Things That Happen To Your Health When You Own A Dog - Yep! Owning a dog is one of the simplest joys in life, and research shows that having pets can be beneficial to your health. Not only can the presence of a dog in your day-to-day life lower your stress levels, but Fido can also help decrease your kid’s risk of asthma, help you feel safer and more. Here are seven things that happen when you own a dog. Studies show that owning a dog will prompt you to stay active. 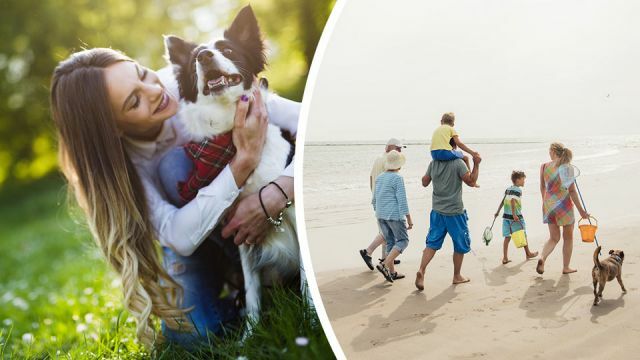 In a 2013 review published in the Journal of Physical Activity & Health, the authors found that dog owners engage in significantly more walking than non-dog owners. Across all the studies examined by the authors, 60 percent of dog owners walked their dog a median duration of 160 minutes per week, and a median frequency of four times a week, far more than non-dog owners. A 2011 study published in the same journal focused on observational data collected at parks. More people without dogs tended to use the parks than those with dogs — 73 percent versus 27 percent — but when the weather was bad, dog owners continued to visit the parks when non-dog owners stayed home. So, it seems that no matter the weather, owning a dog will prompt you to stay active. All that time outside is just one way that dogs make you happier. A 2011 study published in the Journal of Personality and Social Psychology examined the lives of 167 pet owners and 50 non-pet owners. Researchers measured levels of depression, happiness and well-being. According to the study, pet owns experience a greater sense of well-being. Dog owners, as opposed to those who own other types of pets, were less lonely, less depressed, were happier, tended to have less stress and had higher self-esteem. People who bring dogs to work report lower stress levels. If you work in a dog-friendly office, taking your pooch to work with you can lower stress levels. Employees in an office in Greensboro, North Carolina, participated in a self-reported test. Those who brought their dogs to work reported far lower stress levels than dog owners who didn’t bring their dog with them. The results, which were published in the International Journal of Workplace Health Management also indicate that when dog owners bring their pets to work, it benefits non-dog owners as well. So, if your workplace allows dogs, it will do everyone good if you bring them along. Having a dog at home can help lower your child’s risk of asthma attacks and stave off childhood eczema. Two studies presented at the 2017 American College of Allergy, Asthma, and Immunology (ACAAI) Annual Scientific Meeting might make you want to adopt a dog for your kids’ sake. One study found that babies who were born in a home where there was already a dog during their mother’s pregnancy are less likely to experience allergic eczema during the first 10 years of their life, compared to babies born in non-dog owning homes. The second study found that dogs can help protect kids against asthma, even if those same children are allergic to dogs. A German study found that dogs could detect lung cancer from breath samples. There’s ample anecdotal evidence about a dog sniffing out cancer in their owner, but now we have some science to back up those stories. A German study from 2011 found that dogs could detect lung cancer from breath samples. The dogs were so accurate that they were able to differentiate between lung cancer patients and those who had chronic obstructive pulmonary disease. In Japan, a Labrador retriever reliably detected bowel cancer in its early stages in patients’ breath. The study, published in the British Medical Journal concluded that cancer does, in fact, have a scent, and it appears that dogs can smell it when we cannot. That’s no surprise to dog owners who let their pup sleep at the foot of their bed. During waking hours, having a dog around the house can also help prevent intruders and may dissuade pesky solicitors from knocking on your door a second time. The mere presence of a dog can help reduce Alzheimer’s and dementia outbursts in elderly patients. 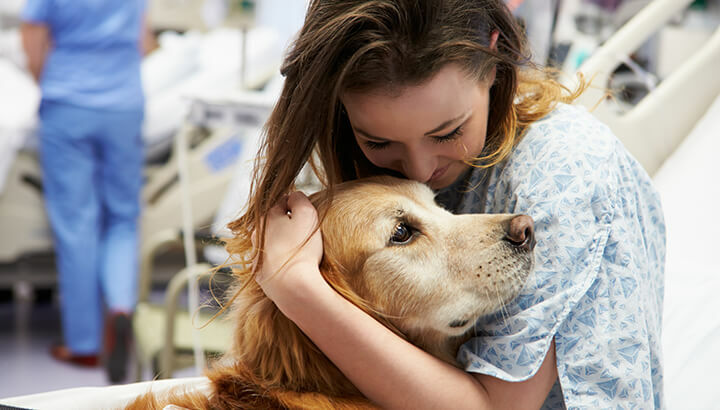 A 2002 study found that Alzheimer’s special care units that had a resident dog experienced significantly fewer behavior problems among the residents than those without a resident dog. Older adults without Alzheimer’s or dementia also benefit from a dog — you have someone to take care of, accompany you on walks, and talk to even if getting out of the house is difficult. Plus, heart attack survivors and those with serious abnormal heart rhythms tend to live longer if they own a dog. If the above information makes you want to go out and get a puppy, we encourage you to adopt a four-legged friend. Animal shelters and rescue groups are always looking for homes for animals who need a forever family. There are even a number of organizations that specialize in breeds, so whether you want a boxer, a pug or a dachshund, chances are there’s a rescue group that focuses on your ideal breed. If you do go to a breeder, make sure you choose a responsible one. Just because a breeder has AKC registration papers doesn’t mean they’re responsible. Finally, avoid getting a puppy from a pet store. Most pet stores sell puppy mill puppies, despite their claims. As appealing as it might be to “rescue” puppy mill puppies from a store or individual, it only funds the puppy mill industry. Whether you adopt a puppy or dog soon, or you’ve had one for years, it’s nice to know that your furry friend brings health benefits to your home that go beyond the simple joy of having a dog. How has your dog positively impacted your life? Hey Buddy!, I found this information for you: "7 Amazing Things That Happen To Your Health When You Own A Dog". Here is the website link: https://www.thealternativedaily.com/7-amazing-things-that-happen-to-your-health-when-you-own-a-dog/. Thank you.